Photo by Johnny Nguyen, Portland, Oregon. Oringally published in The Oregonian newspaper. When I was a child, I learned that my neighbor’s brother was a Cleveland police officer who had been killed in the Glenville riots in the 1960s. His name was Louis Golonka and he was shot after he and other officers bravely chased snipers into an alley where gunfire was exchanged. That day was July 23, 1968. When I grew up, I became a police officer and remember the riots that resulted from the Rodney King incident in Los Angeles on March 3, 1991. And now, I watch as the city of Ferguson, Missouri seethes under the strain caused by the shooting of Michael Brown. What is bothersome is the recognition that our nation will likely experience a similar problem in another 23 years, if not much sooner, which begs the question of how much progress has been made in the relationship we have with those we serve — particularly black Americans who have historically suffered under oppressive police actions. That missing ingredient is trust. And until more of it becomes engrained within our nation’s borders, too many of our neighborhoods will be tinderboxes smoldering until the next cop uses force that may be “perceived” as excessive. So what should we do? There are lots of ideas but, unfortunately, too many suggestions will be fraught with political nuances or selfish agendas that are unreasonable or, worse, that will ignore our safety. Once we enhance that ingredient, our credibility will improve, so when something unfortunate happens that results from aggressive action by a peace officer, Americans will be less inclined to jump to conclusions and instead view matters in the totality of the circumstances — generally confident that their public servants had to take strong measures when necessary. And if something was done incorrectly, they will own up to it while working to prevent it from happening again. Gaining that trust is a comprehensive project that is not achieved overnight, but its effort can begin immediately as each positive officer/citizen contact can build a brick on a foundation that over time can eventually withstand storms of mistrust. And mutual respect is the glue needed to hold those bricks in place. There are many places to start. Since officers’ use of force is the current topic in the news, police leadership in collaboration with civic and educational partners should begin by trying to teach people just how dicey force decisions can be for officers, so more Americans have the chance to see these situations from the perspective of an officer whose life is at risk. Instead of understanding force by police from television, young people should learn in a civics class about the landmark Supreme Court case Graham v. Connor that established the groundwork for when cops can use force, to include deadly force. And who better as a guest instructor than a peace officer? This effort can also be accomplished through more citizen police academies that allow participants to train in force simulators, public service projects and forthright explanations by police spokespersons. 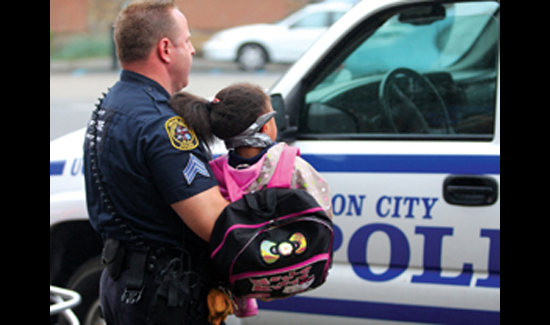 Police agencies should also endorse an empathetic model of policing that is basically community policing to the tenth degree. It is a thought process that can influence an entire police culture and begins during hiring when agencies search for candidates who are not only brave but compassionate. It values catching bad guys while helping the downtrodden. This style focuses on interpersonal relationships and places great emphasis on the Golden Rule in its citizen contacts. Balancing the spirit of the law and its letter is critical, and teamwork is vital, because officers need to have a symbiotic relationship with their customers to make their neighborhoods safe places to thrive as well as to prevent crime. 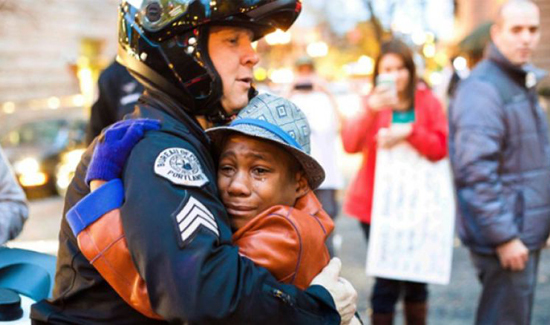 Put simply, empathetic policing and trust are synonymous. We owe it to them to enhance that trust with those we serve so that fewer officers get killed or hurt. Because, when a community has a cop’s back, the officer will be safer and will have more success in accomplishing our mission. Tom Wetzel is a suburban police lieutenant in Northeast Ohio. Tom, you’re spot on. I like your phrase, “If trust is a must, it’s up to us.”, because trust wherever placed is earned. and to change a culture of mistrust unfortunately will take most if not more than. 23 years because it will take at least that form the next time it happens. But as the statistics show, it IS happening LESS and LESS. That’s according to the ODJ’s own report (http://www.city-journal.org/2014/eon1204sm.html), although you wouldn’t know it form listening to the Attorney General.